Rethinking Assam's problem through the prism of settler colonialism is a very useful tool for addressing age-old problems of identity and politics in Assam. It provides insights for developing new possible futures for the communities affected by settler colonial politics. It is an important and original contribution to scholarship. Exhaustive piece of research primarily focusing on the historical and contemporary trajectories of strife and unrest in the state of Assam. Goswami has tried to provide a new and different interpretation of these developments in terms of comparing it with settler colonialism in other parts of the world. Post 1857, a new form of colonial rule was experimented in India’s North East. This came to be known as indirect rule colonialism. The focus of this book is the indirect rule state, which is a typical modern form of rule in a colonial setting. The management, rather than eraser, of social differences is the core of this modern society and state craft. Using history, census and law, there was a shift from a homogenizing nationalism to silo nationalism. This gave rise to new forms of hegemonic political identities and the society shifted from a binary to a triangular form of relationship. This modern form of state craft is institutionalized by colonial underpinnings where indigenous people, migrants and the Assamese occupy the vertexes of the triangulation, each vying for their own space. This form of statecraft and society freezes identities and creates friction. The genesis of structural violence is thus traced to the underpinnings of indirect rule colonialism.The troubled and violent post colonial history of the region does not connect to a standard national narrative as the conflicts are inbuilt in the social structure. Using settler colonial studies as a framework to analyse the frozen social relationships, this book makes a bold statement that the region is not fully decolonized as the colonial content and intent still continue to subsist. The book offers a new way of thinking of relationships between nationalism, sub-nationalism and religionism in Assam. Sanjib Goswami is a researcher as an Adjunct Research Fellow, Swinburne University of Technology, Australia and Adjunct Professor at the University of Science and Technology, Meghalaya. 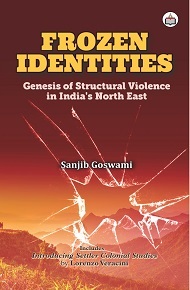 His core focus is in the colonial and post colonial political history of India’s North East. Goswami was born in Assam and has studied in India for his Masters and Law degrees and in Australia for his Ph.D.In 2007, he received training in the USA under the prestigious International Visitors Leadership Program on Community Issues and later did a Certificate course from Emory University on Understanding Violence.He is prolific writer having several peer reviewed publications to his name. He has wide ranging experience in the non-profit sector and has received several national/international awards and recognitions. Presently, he is in a senior research, policy and coordination role as Officer on Special Duty to the Minister of State for Railways, Government of India.